Badoo has released an update for its Badoo social app for Android in the Google Play Store, bumping it up to version 4.9.1 with bugs fixed and overall performance improved. As always, we provide you the latest APK file of the app. 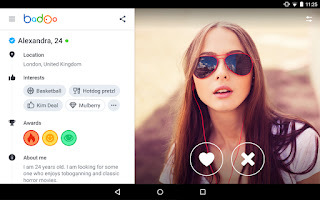 You can download Badoo 4.9.1 apk here. Badoo is one of the best social apps for meeting new people that allow you find new people in your area, chat and make friends. Badoo mobile application is a powerful and sweet simple to use application. The app gives you the opportunity to relate with friends in your vicinity. You can look at other people in your local area as to distance and gender on the App, find people you’ve bumped into and start chatting with them. Great app to chat with and meet many new people in your area. Especially when looking for love and friendship. Along with the usual bug fixes and performance updates, that makes for a pretty nice update makes it even better. You can download the app on the Google Play Store or get the Badoo APK latest version from the link in the below and then install it manually on your Android smartphone and tablet. Let us know what you think in the comments.